The concept grows out landscape ecology and a commonly used definition is “the degree to which the landscape facilitates or impedes movement among resource patches.” In turn, “resource patch” is a discrete, homogeneous area on a landscape that differs from its surroundings, in effect a sub-unit of a landscape. Some talk about patches as islands on a landscape. Sometimes patches get broken up, or fragmented, into smaller units through farming, development or climate change, and species that depend on the patches are put at risk. Fragmentation impedes the migration, dispersal and genetic exchange of wild species. Connectivity, often through habitat corridors, enables the movement of species between patches and the functioning of the ecological system within a landscape. Identify several natural resource patches in your area. Identify some of the species that inhabit those patches. 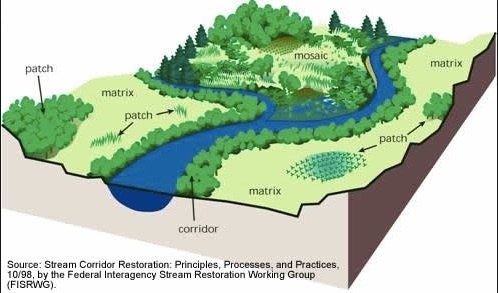 Design a way of providing connectivity between several patches so that the habitat for one or more species is preserved or enriched.